BEST VALUE – BUY a 2nd one and GET 30% OFF (or 3 pounds DISCOUNT, you can choose)! Easily stored away & Easy usage: Just add ice cubes in it! QUALITY material – Beautiful DESIGNS! 2 SIZES: 5 or 9 INCH to suit most shapes and sizes! FLEXIBLE & WRAPS AROUND any shape easily! No more awkward and uncomfortable plastic unknown blue gel ice bags! You have trouble with sudden headaches or joint pains? Make sure you always have one of these ice packs handy! 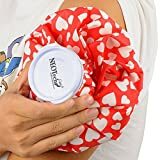 It’s amazing for icing down headaches, sore muscles, and other knee or joint pains. Get immediate cold therapy by just putting ice cubes or crushed ice in the bag and locking it securely.